DaVine Limousines gives you Christchurch's very 1st 16-seater Luxury Style Limousine Coach, offering a hostess for that special touch. Custom built by Barry Ward who based his design on American Limousine Coaches, its unique splendour will surprise you. When you think of a limousine, what pops into your mind? DaVine Limousines offers you all of the above and more. Not only do you get all the comforts of a limousine but you also get even more space than a luxury coach. DaVine Limousines has brought you a fresh new way to spoil yourself, friends, family, clients, colleges, or overseas guests. Our passion is to design something special just for you. 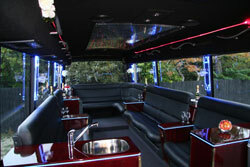 You can also choose one of our relaxing limo tours. Or simply hire our coach for that special occasion. Contact DaVine Limousines today for your luxury transport requirements book the limo coach or make a general enquiry.